“Japanese Monsters” is an educational lecture by Glenn Andreiev. Giant reptiles, moths, robots, and other odd behemoths demolished Tokyo in so many Japanese Monster films from the 1960s. American film critics treated these dubbed films poorly, but newly restored prints in their original Japanese language prove they are well-crafted works of monster-movie art. 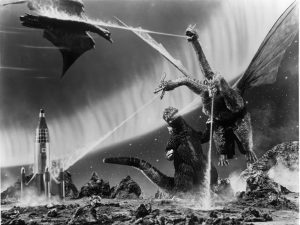 While on the surface, these are entertaining monster movies, they also tell the story of Post-War Japan rebuilding itself. Historian/film maker Glenn Andreiev tells the backstory of these films.